With roots in the laments of the underprivileged and dispossessed, and the songs of sailors who travelled to Africa and Brazil, the soulful musical-poetry of fado was born on the narrow streets of Lisbon’s working class quarters in the early 19th century. It has been nurtured in neighbourhood tabernas ever since—seasoned by generations of fado singers (fadistas) who carry on the tradition and make it their own. Fadistas sing about life’s fervent joys and cruel heartbreaks, love’s beauty and loves lost—their words and voices a poetic response to the impotence we feel when faced with Destiny (fado comes from the Latin “fatum” or fate). It is imbued with saudade, the uniquely Portuguese expression that roughly translates as an unrestrained indulgence in yearning. Backed by an acoustic (often Spanish) guitar and the tinkling runs of a Portuguese guitarra, fado singers tremble with intensity. Their voices swoop up and down minor-key octaves, holding notes with anguished tremolos. At its core, fado is both essentially Portuguese as well as universal in nature—it has become the song of the world. You don’t have to be, or even understand, Portuguese to become entwined in its passion. "Fado is an emotional kind of music full of passion, sorrow, jealousy, grief and often satire. Fado is something that comes from the heart. It's more a feeling than a music." 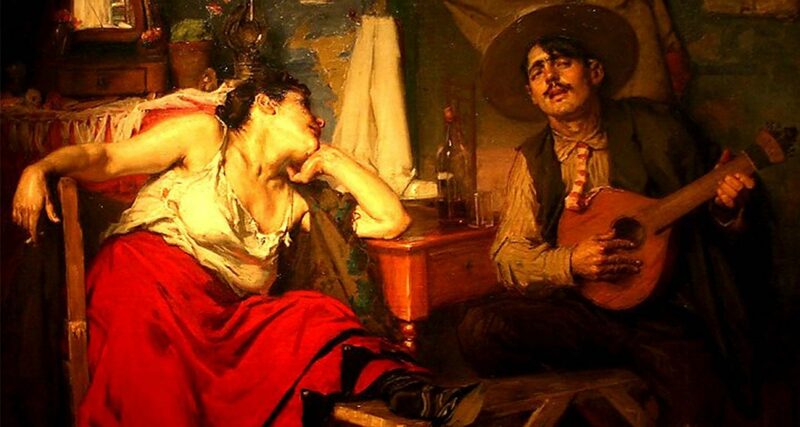 Famous oil painting by José Malhoa depicting the emotion of fado, c. 1910.